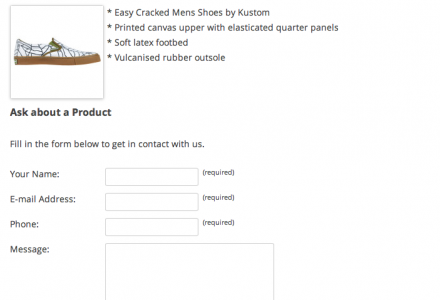 Product Enquiry adds a contact form to the Product detail page within WP e-Commerce enabling prospective customers to connect with the store owner for further information before buying. This Plugin is also ideal for ‘brochure’ sites – stores that do not want to offer shopping cart functionality within their WP e-Commerce store – preferring customers contact the store directly to purchase Products. 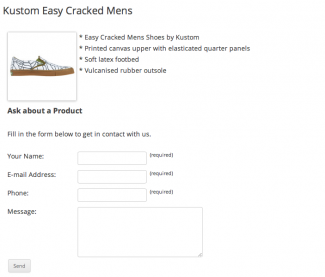 With this solution customers can contact you directly from the Product page instead of through your Contact page. Looking for support, a copy of the readme, Plugin updates, Ideas or usage instructions? 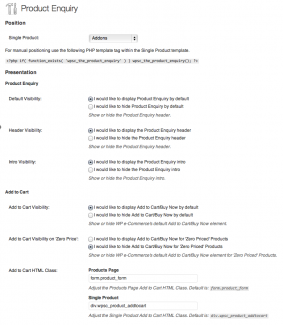 Check out our Documentation for Product Enquiry. Hi my friend, I need to add a warning message or delivery confirmation please. With WP Commerce, WordPress and the latest updated release of this plug in, I am not able to see recaptcha on the front end and I am not able to remove it on the back end. It defaults to checked even if I uncheck it. What are my options to get it to work? Hi Pete, please update to the 1.4.9 Plugin update that resolves this. If I click “send” without completing any field, the form does not alert the user to have to complete the information. Hi davito, thanks for raising this. I’ll take a look at any reason for the jQuery validation to not be working in stores. Hi davito, the 1.4.7 Plugin update fixes the jQuery validation issue. I’m now working on additional field support for the next release. Great! . How can I get the 1.4.7 version? Hi davito, you can download the latest release from My Account along the top menu. Other issue, Where I can specify which e-mail goes the form submission? Hi davito, Product Enquiry uses the admin e-mail address specified under Settings > General as the e-mail address used after form submission. I’ve added an E-mail Address option in 1.4.8 to override this via Settings > Product Enquiry, you can download this now from My Account. 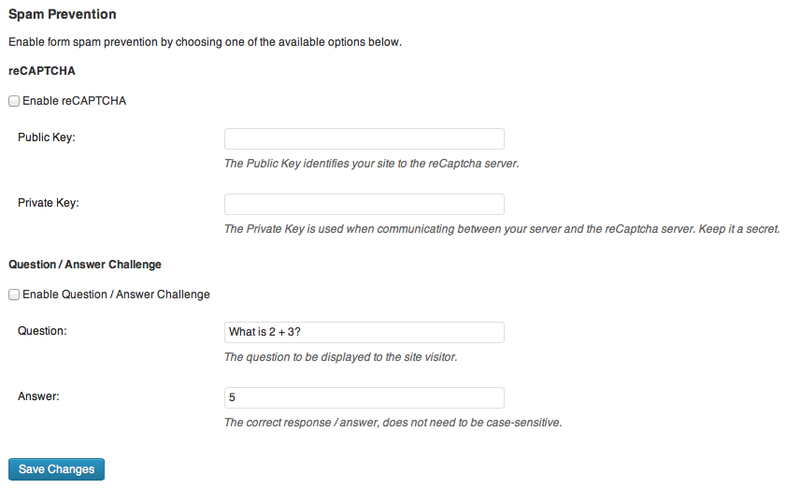 Other issue, when I check enable the “Question / Answer Challenge” and dosen’t appear. Have an approximately when will solve these issues? Hi davito, please download the 1.4.9 Plugin update to resolve this. I’ll include the additional columns support in the next Plugin update. How can i add a new field to the form ? Hi Mihai, the current release of Product Enquiry only supports those fields. I’ve added to my todo list to add custom fields (e.g. Phone number, etc.) and will release a minor Plugin update to address this. Do you have any idea when can you release that ? Need some extra fields badly. Hi Michael, I have the same need. The posibility to ad more fields. Hi davito, I’ve added this to the task list for the week. Without having purchased this plugin yet, do you think that this would be possible using this plugin? Just purchased this plugin – exactly what I needed for a client’s site. Works perfectly! Quick question, I’d like to add an ‘enquire about this product’ link to sit under each item on my products page. Which files would I need to edit to do this? Cheers for any help. thanks Michael, be really useful – I’ll keep an eye out for it. Very difficult to judge whether this is what I would want from your screenshots. Do you have a demo version of your plugin available? Hi Michael. I would really love to see a demo of this. Can you please point me in the right direction as I really need to get this sorted for a client. I’ve also contacted you via your email on your visser.com.au website. Many thanks. Can I add an additional field to store the customers phone & mobile number? I usually respond to enquirers by calling them. 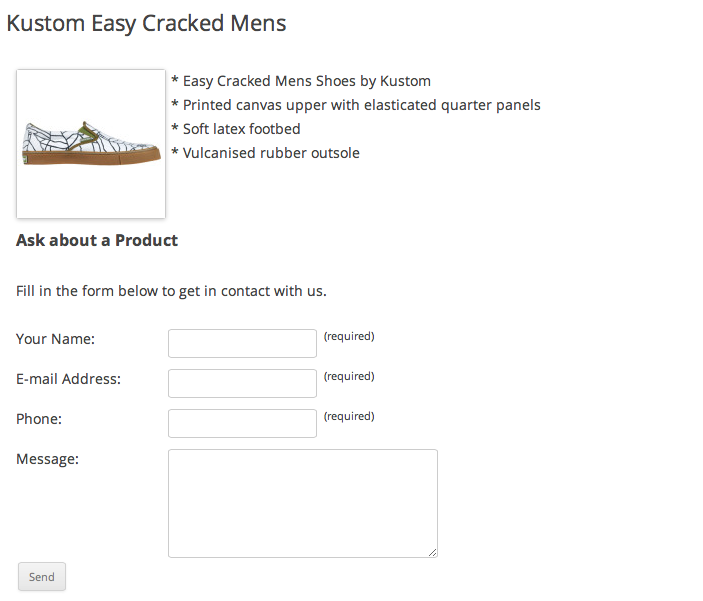 Hi Mike, Product Enquiry currently has fixed fields but love the idea of adding customised fields, I’ll look into this. I’ve added an Idea to track this. 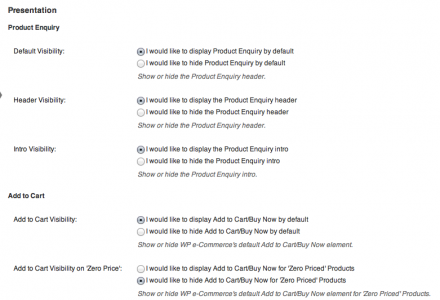 I was hoping that I may be able to set product enquiry off by default? This also lead me to wonder if there is a way, if the price is $0.00 in WPEC, I want the customer to contact the shop via the form and the price not to appear at all as I don’t want customers going through buying things for nothing 🙂 and I can’t put in a current price or disable the price altogether? Maybe next version a tick box next to the price in the admin that says, contact store for current price? Great work on this plugin! I just bought it then and it’s working great. There was one small bug though. 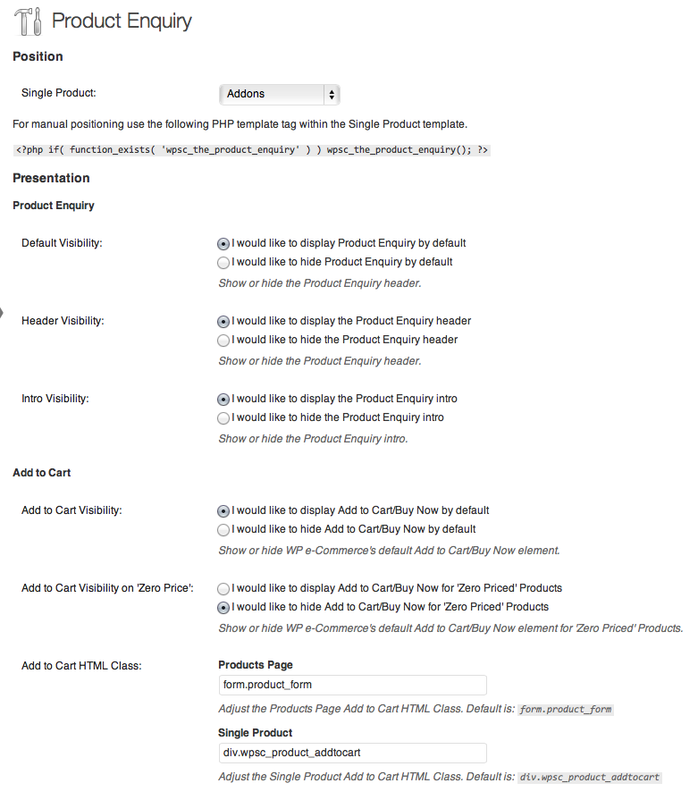 In product-enquiry.php php on line 357 you’ve got the variable name as $position_product instead of $product_position so the selected state of the Position option isn’t reflected in the options. The options update fine and everything though. Hi Bronson, thanks for the heads up. I’ve fixed that and am just adding Michael’s feature suggestion, should have an update out today or tomorrow. Does this now allow for per product management? I need some products to say Enquire – and other’s to say Add to Cart. Is this the solution for me? Hi Isalbella, I’ve been able to reproduce this issue. Seems 3.8.5 has changed the results from the wp_query object query. I’ll modify the Plugin to detect and display differently for versions going forward. I can not get the inquiry box to show up on my products page. Any ideas? The plugin is installed and has been activated. I’m using the Mazine theme with WordPress 3.1. Product Enquiry comes with a Quick Start document (readme.txt) to help with installing the Plugin. Additional support can be found from the Contact page or methods below. If you have any problems, questions or suggestions please join the members discussion on our Product Enquiry forum. This Plugin requires the 'wpsc_top_of_products_page' template hook which is included with WP e-Commerce, please ensure this template hook is available within your active WP e-Commerce theme.